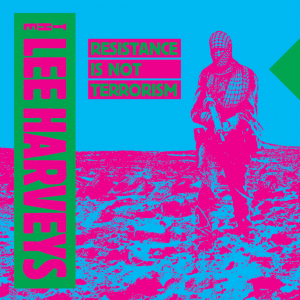 AS THEIR NAME might suggest, Dublin punks The Lee Harveys – made up of musicians who have been hanging around the Irish punk scene since the early 80s – were originally very much about American political protest songs. An odd niche for a Dublin-based band, perhaps, if one most punks would agree offers fertile ground. The band are angry, firing off two-minute, politically potent tracks on themes like Israel and Palestine, gun crime and a certain Donald Trump. Their latest EP, due shortly, is entitled ‘Resistance is Not Terrorism’, and – amongst other themes – rounds on Eurovision’s visit to Israel with an ‘alternative Eurovision’ track. “We’re not against the Israeli people, we’re against what’s happening over there. I think it’s like holding the Eurovision on the Shankill Road in the middle of the troubles,” Bitzy Fitzgerald explains. There’s a real punk ethos to the way the Lee Harveys release their music, too, with circumstances seeing the band cram their new ‘EP’ with old classics because they can. 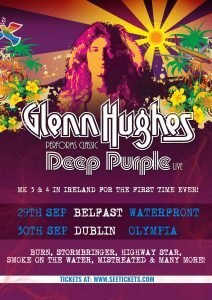 GLENN HUGHES is a legend in rock circles, a curly haired bassist with a distinctive vocal, one of the icons of the genre. Famed for a substantial self-destructive streak in his prime, the man known as ‘the voice’ was a real manic rockstar, once beset with substantial drug problems as he performed with Deep Purple, Trapeze and Black Sabbath through the 70s and 80s. Hughes was the bassist and vocalist in the Mk II and Mk III versions of his most iconic project, Deep Purple, sharing vocal duties with David Coverdale. Those were troubled times; he’s turned his life around over the last couple of decades, and thrown himself into musical projects, an air of ‘making up for lost time’ about his work. “I’ll be playing the tunes from when I was in Deep Purple, the ones we wrote, and the ones I played over those years. You’ll get all the classics, and we’re doing a lot with them. They sound huge live,” he explains. 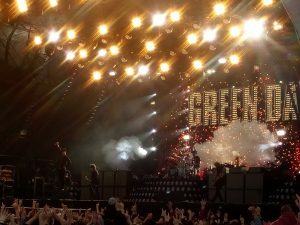 THIRTY ONE YEARS into a career that’s taken Green Day from gritty pop-punk scenesters to a far more accessible brand of pop-rock, California’s finest still play Kilmainham with the energy of an act auditioning for their first big break. An indication of the sands of change came earlier in the day, however, as frontman Billie Joe Armstrong spent the morning searching for the quayside venue where the three-piece first played Dublin way back in 1991, only to find it’s now a Starbucks. While time has certainly changed Green Day, too, all evidence is it hasn’t dulled them one iota. Armstrong’s brutally energetic, interactive fronting of the band is the kind of cheese-fest that sometimes falls the wrong side of cringe – particularly in his habit of espousing his band’s ethos on stage as a list of mundane inclusivity catchphrases – yet is utterly absorbing. The balance here is strong, too. After opening with three new-ish songs (the very first of which features an audience member on stage draped in an Irish flag), there’s a comforting depth of the back catalogue to be trawling for the older fans. The likes of ‘Longview’, ‘She’, ‘When I Come Around’ and ludicrously glorious cross-dressing anthem ‘King For A Day’ are delivered at near album quality, and with just enough snarl around the edges. The continued presence of lots of essential albums ‘Nimrod’ and ‘Dookie’, served up together with the best of ‘American Idiot’ and even a dabble in the uninspiring ‘Warning’ on the setlist is the act of a band aiming to please. Newer material is so thin on the ground here it could almost be a career retrospective, a crowd-pleaser that lasts 25 tracks and two and a half hours. The highlights are acoustic closer ‘Good Riddance (Time Of Your Life)’, huge fireballs across the back of the stage during peaky choruses, a lengthy pre-gig audience sing-along to Queen (plus a pink rabbit ‘giving birth’ to giveaway soft toys), and an entire track played on guitar by a young audience member who was then handed the instrument to take home. For all the oohs, ahs and hand waving, it’s utterly engaging. Harsher critics will say modern Green Day is pop-punk by numbers, and there’s an element of truth there: Armstrong, Dirnt and Cool are very much fire-shooting, stadium-loving rays of sunshine these days, doing little more controversial than singing about masturbation and venting against Trump while throwing in the odd Operation Ivy cover on the process. That the show lacks edge, truthfully, only matters if you’re holding Green Day true to their 90s roots. What they do offer is one of the music scene’s better doses of nostalgic familiarity, packaged in one of the liveliest, most memorable stage shows going; more ‘Having A Blast’ than ‘Burnout’. As published in the Dublin Gazette, July 6 edition. Reproduced here with permission. This article is part of a series of feature interviews prepared for the Dublin Ladies’ Gaelic Football Association ahead of their All Ireland 2016 final with Cork. For Sorcha Furlong, one of the most experienced players on Dublin ladies 2016 senior panel, this season has been very much about change – changes in roles, changes in her position and changes in her approach to the game. One of an ever-dwindling number of survivors from the county’s only All Ireland win in 2010, Furlong gave serious consideration to her role before the season started this time around, before deciding to sit out the league stages of the season, and take on an eight-week coaching role at the county’s under-21 side ahead of their All Ireland tournament instead. With the under-21s going on to win an All Ireland, Furlong’s decision was not only a success, but had the benefits of a change of pace, helped forge still stronger connections with the senior team’s management and gave her a break at the relatively blunt end of the season. An added bonus came in the make-up of the under-21 side, many of whom are also involved in current senior panel, allowing Furlong to firm up her own senior relationships. Furlong, in fact, has been playing at various age-groups in the Dublin set up since around 2003/2004, which means her county involvement is now approaching half of her life. Outside of the sport, she’s a P.E teacher, though despite her school having a football program, she prefers to take a step away, and is currently involved mainly in teaching volleyball. The heart doesn’t thump. It’s more like pum-POOM, falling at intervals of just over a second, and accompanied by the barely audible pressure of blood forcing its way into a ventricle. In here, it seems to beat at the volume of human speech, though it’s dramatically overpowered by the slight creek of a gentle raise of the arm in the darkness. My surroundings are such an empty nothingness that I can only tell for certain whether my eyes are open or closed by poking at the eyeball. Occasionally, without warning, an anatomical extremity collides with the invisible walls surrounding my half-naked body. It’s the gentlest of collisions, but its unpredictability sends a tsunami of shockwaves through the darkness, bouncing my floating body back into a seemingly static yet endlessly unstable state of suspension. About 45 minutes pass, and I turn on the light switch. I’m floating in a salty bath in the blindingly dark confines of what’s essentially a blacked out, nicely heated paddling pool. It’s intimidating at first, yet the kind of blackness that descends when the lights flicker out – fused with the deathly silence aided by ear plugs and the gentle two-tone beat of the heart – quickly evaporates any concept of time. Soon afterwards, the head begins to swirl with entirely un-stimulated randomness, spinning between complete consciousness and a day-dream state. After five minutes, virtual to-do lists and ‘thinking time’ are exhausted and overwhelmed. Sheer serenity, empty space and stress relief kick in: I’m floating in a carbon fibre tub in a central Dublin basement, but I could be anywhere, or equally, nowhere.